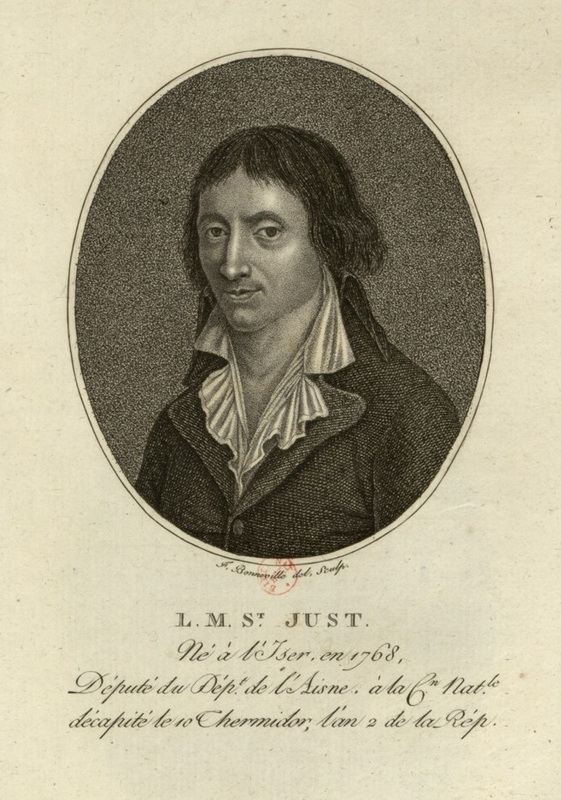 Rodama: a blog of 18th century & Revolutionary French trivia: Saint-Just - Angel of Death? The following is (mostly) taken from the opening chapter of Bernard Vinot's biography of Saint-Just, the French text of which is available on Google Books. The physical appearance of a man of state has rarely assumed such importance as it has in the case of Saint-Just. History is facinated by the image of Saint-Just as the ruthless angel of the Revolution, by his androgynous beauty. But was he really so handsome? Of middle height, with a healthy body, proportions which show strength; a big head, thick hair, bilious colouring, small lively eyes, a disdainful expression, regular features and an austere appearance, strong, but veiled voice, with a note of anxiety, a sombre air of preoccupation and determination, an extreme coldness of tone and manner - thus appeared to us Saint-Just, who was not yet thirty years old. Without his fixed, hard eyes, his heavily drawn brows, Saint-Just might have passed for a woman. Was this the virgin of Tauris? No, neither the eyes nor the skin, though white and fine-textured, suggested a sentiment of purity. This very aristocratic sin, with its singular lustre and transparency, seemed too lovely, and led one to suspect its healthiness. The huge, close-knitted cravat, which he alone wore at that time, made his enemies say, perhaps without reason, that it concealed cold humours. The neck was virtually suppressed by the cravat and by the high, stiff collar; an effect all the odder in that his long waist did not lead you to expect this foreshortening of the neck. He had a very low forehead, the top of his head appearing depressed, so that the hair, without being long, almost touched his eyes. But strangest of all was his gait, of an automatic stiffness which was entirely his own. Robespierre's stiffness was nothing to this. Did it derive from a physical oddity, from his excessive pride, from a calculated dignity? - No matter. It was more intimidating than absurd. One felt that a being so inflexible in his movements must also be inflexible in his heart. Thus, when in his speech, taking up the Gironde and abandoning Louis XVI, he turned stiffly, all of a piece, to the right of the Chamber and released along with his words his whole person as well, particularly his hard and murderous stare, there was no one present who did not feel the chill of steel. History of the Revolution V, ix.5 1851. Visual representations are almost equally unreliable. In the years following the Revolution, Saint-Just often came to be seen as the embodiment of beauty and youth. 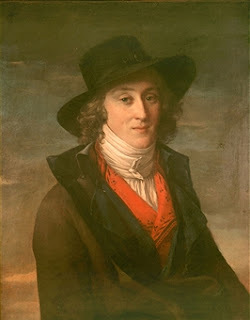 Portraits of elegant young men, with or without high cravats, were identified as him, for example the sanguine attributed to Christophe Guerin in the Carnavalet which has no established connection. (Saint-Just is not usually portrayed as wearing an earring!) 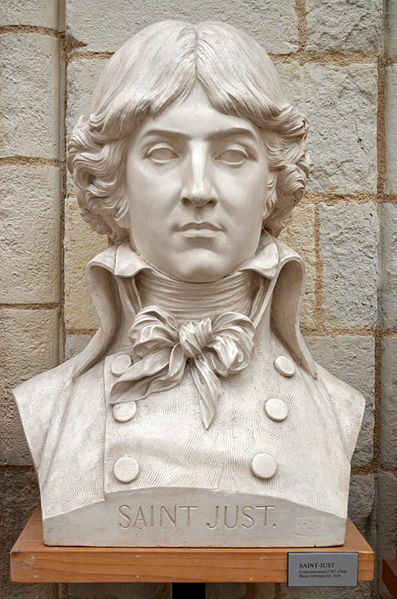 Numerous representations created after his death, such as the medallion and bust by David d'Angers or the engraving by Bosselman fils to illustrate Lamartine's History of the Girondins, show just how quickly the myth of Saint-Just's beauty hardened into received fact. Some portraits, however, can lay claim to authenticity. 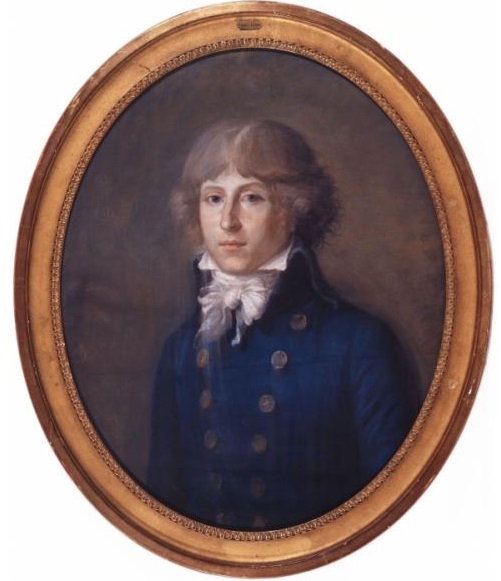 One is the anonymous pastel, created when Saint-Just was at the hôtel des États-Unis, which was later retrieved by Élisabeth Le Bas and kept by the Le Bas family as a venerated souvenir. 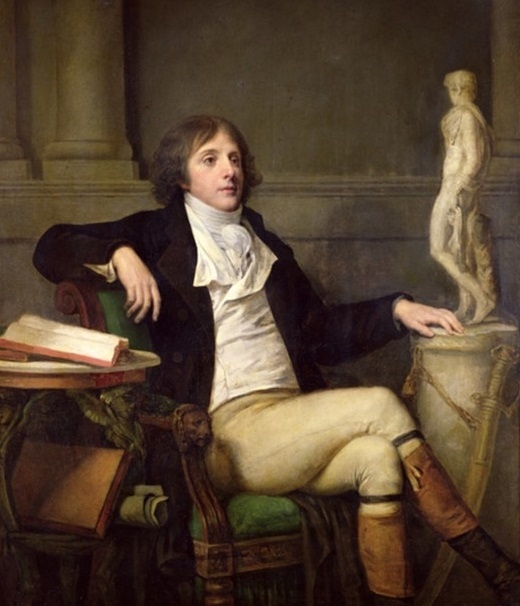 Another is the portrait by Prud'hon; the artist was a fervent admirer of Robespierre and a regular at the Duplay household where he probably met Saint-Just. In the corner of the canvas is a personal dedication: "A Saint-Just. P.-P. Prudhon 1793". The two portraits are similar; they show the same oval face, the same lips, clear eyes (brown rather than blue), long nose and long chestnut hair. These features are also evident in the portrait by David and in one by Greuze, where the young deputy poses with his ceremonial sabre as Représentant en mission close by. Also worthy of note is the engraving by François Bonneville, an artist who specialised in portraits of Revolutionary celebrities. It is the only representation of Saint-Just which gives his title, the date and place of birth (albeit inaccurately) and the date of his death. It is incontestably more or less contemporary. 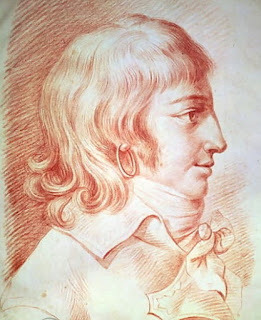 The engraving which appeared in 1796, at the height of the Thermidorean reaction, is unflattering....but it at least contradicts Michelet's claim that the habitual cravat concealed a blemish to the throat. The subject is portrayed with an open collar, hard features, and the long nose of his father. 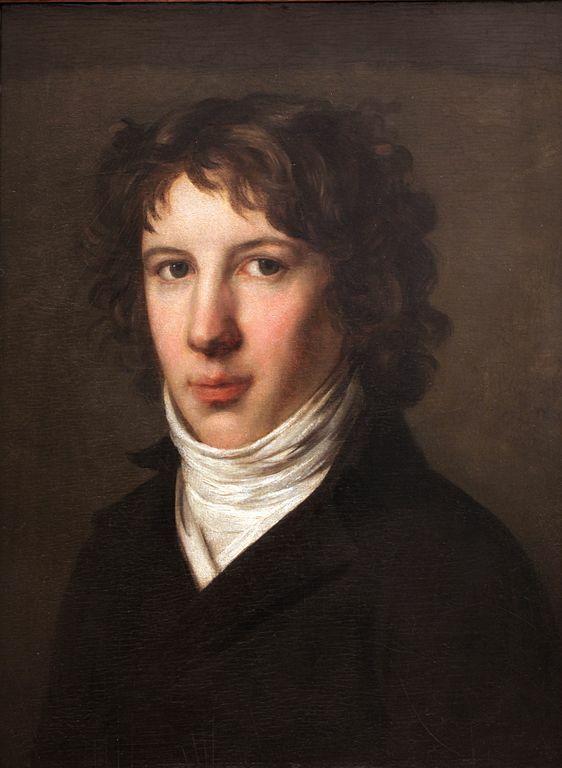 He ressembles the man depicted by Greuze and David, but appears older or more fatigued. Bernard Vinot concludes that in reality Saint-Just was not particularly feminine, or even all that good looking. He inherited the unappealing features of his two parents: a long face, long nose and long neck. These were were softened by his youth and camouflaged by his sure dress sense, but no doubt the passage of time would have accentuated them. Had he lived to middle age he would have come to resemble his father - strong, masculine and serious to be sure, but without beauty. (I think Bernard Vinot is being kind here; what he really wants to say is that Saint-Just would have been ugly, just like his dad.) This aging process, aggravated by stressful days and nights without sleep was probably perceptible even in 1793. Iconography and portrait sections on the "Site Louis-Antoine de Saint-Just"
Is the Greuze definitely him? 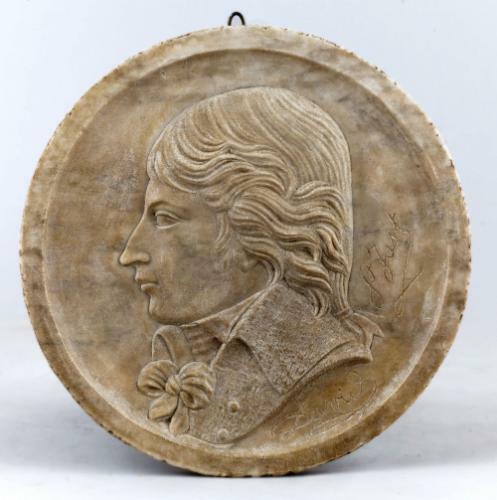 I've also seen it labelled as Talleyrand. I agree the earring drawing probably isn't him: the features are different (he has a longer chin). With the Bonneville engraving, I think the different medium contributes to giving a harder impression (more contrast-y). No the Greuze isn't definite, but Bernard Vinot thinks it is Saint-Just. It doesn't really resemble other portraits of Talleyrand. The hair is certainly very like the Saint-Just pastel, but how many young men had the same trendy haircut (then as now)?